Knowing the value of vocational training to improve young women’s confidence, skills and workplace readiness, DSMT contributed to a large on-going project run by Christian Aid through local partners to improve the employment prospects of marginalised young Palestinian women living in refugee camps in the Occupied Palestinian Territories and Lebanon. The training aimed to increase women’s skills and confidence to be able to earn their living and support themselves and their families. Young women have gained employment in a range of areas as well as some setting up their own businesses, for example in insurance, catering for festivals, fitness gyms, hairdressing and graphic design. Maha Hamdan was able to secure a job in wedding photography paying $400 a month thanks to the photography course provided by Association Najdeh. 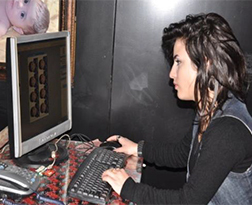 With her new qualification, she was able to secure job training at Seif El Mir Photography Studio in Jabal el Beddawi for one month. After her training, the employer offered her a paid job with a monthly salary of $400.